Black Prince - crossing with Listán Prieto / South Africa? Muscat d'Hamburg - crossing with Schiava Grossa / England? In any case, it is a very old variety, which is widely distributed mainly in many countries of the Mediterranean, but also overseas. The hypothesis that the name refers to the city of Alexandria and thus to an origin in Egypt indicates, but is unlikely. The statement mentioned in some sources, that from the sort of the favorite wine The Cleopatra was pressed, is no more than a gag. According to another hypothesis they are already long before the turn of the Phoenicians brought to southern Italy. The Romans then spread it in the Mediterranean countries. It will also (like Muscat Blanc) with the Pliny the Elder (23-79) mentioned antique variety Vitis apiana connected. Under the name Zibibbo, the vine was in Sicily Known in the 16th century and was designed by Venice botanist Pietro Andrea Mattioli (1501-1577) mentions (by the way, he was one of the first to describe the tomato imported from America in 1544). The name Zibibbo derives from the Arabic "Zabib" (Zibebe = raisin). Under this name, it is still today in the wines of the DOC area on the Sicilian island Pantelleria used. The hypothesis of a descent from South Africa because of a supposedly there Cape Zibbib is obsolete (there is no such, there is a Cape Zbib in Tunisia). 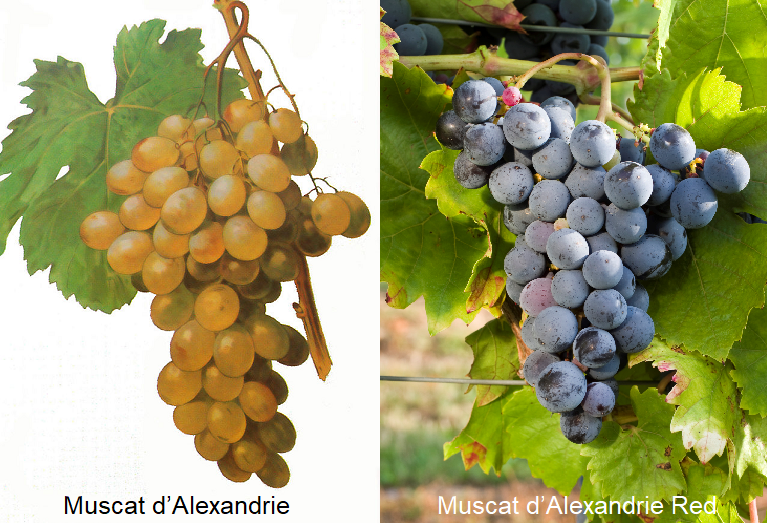 The main name Muscat d'Alexandrie then first appeared in 1713 in Paris and has prevailed. The late-ripening, high-yielding vine with brownish-reddish, sugar-rich berries is prone to real ones mildew. Botrytis and insect infestation. She loves the heat and is therefore hot climates very suitable. The variety yields alcoholic white wines with subtle rose and nutmeg (restrained as with Muscat Blanc). The variety is mainly used for the production of sweet wines used. But it is also called table grape and for the production of raisins used. In northern countries like Belgium, the Netherlands or England It is used for hothouse breeding, which makes it ideal. In South America, she also serves for the distillation from fires like Pisco and singani, as well as the production of RTK (Rectified concentrated grape must). Acreage in Europe or North Africa, there are in France especially Languedoc-Roussillon (2,610 ha), Greece. Israel. Italy especially in the south and the islands of Sardinia and Sicily (1,521 ha), Morocco (3,669 ha), Portugal (647 ha), Spain especially Andalusia and Levante (8,237 ha), Tunisia. Turkey and Cyprus (120 ha). Overseas, there are cultivated areas in Argentina (2,939 ha), Australia (2,043 ha), Bolivia. Brazil (7 ha), Chile (1,090 ha), ecuador. California. Colombia. Peru. South Africa (2,167 ha) and Uruguay, The variety occupied in 2010 a total of 26,336 hectares of vineyards. Compared to the year 1990 with then 64,224 hectares there was an extreme reduction of about 60%. It occupies it in the worldwide varieties ranking the rank 35. This page was last modified at 27 December 2018 at 13:09.